It is uncanny that, even after 25 years in the hiring solutions business, I hardly find any top notch recruitment practitioner who doesn’t confess that she/he forayed into Recruitment/Talent Acquisition by chance, luck or fate. I cannot remember anyone ever saying that when they grew up they wanted to be a recruiter/TA specialist! And it has always psyched me. Time and again we hear: “People aren’t the best assets. The RIGHT people are.” But very little seems to have been done to institutionalize recruiting/ talent acquisition (TA) as a profession. Probing more deeply, I find that often, the TA role is perhaps an entry level role, at times even delegated to a contract employee – to a career in the HR domain, where people aspire to do more glamorous roles in Training, Organisation Development, Performance Management, and so on. Not many have found their way to the corner office. And so there are hardly any ‘role models’ that have inspired generations to consciously pursue a career in Recruitment/Talent Acquisition. Consequently, the book Competing on Talent in Today’s Business World is – to me – manna from heaven! Pradeep Sahay’s book is the foundation for potential professionals to make a mark in Talent Acquisition. -Both the science and art of hiring have been dealt with very meticulously. -Hundreds of tables and visual aids help the reader to assimilate the theory effectively. -And there is also an amazing range of templates that help us to get to the “Why” and figure out the “What” and “How”. And just as one is assimilating these thoughts, the detailed case study (applying the principles to an organisation named Sigma group) leaves one fortified with concepts that have developed over time. It helps us understand how TA has transformed companies into “Great Places to Work” – from mere transactions that are part of the everyday life of hiring. 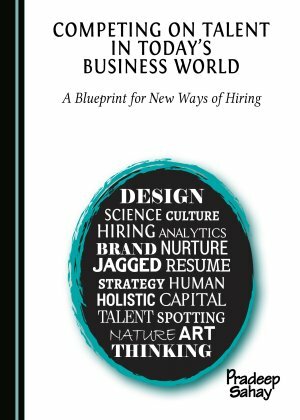 I would not hesitate to call this book the “Grey’s Anatomy” equivalent to help readers become the finest Talent Acquisition professionals! It is surely a textbook that ought to find its way into the best educational institutes – and hungry organisations – and ought to be a handbook that every TA professional can regularly refresh her/himself with.